Let’s take a few moments to remember some of the things that made March 2008 a great month at Unclutterer.com. 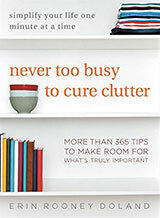 Brainwash your way to a clutter-free life? March 7 — Reader suggested clutter-busting game: I’m moving overseas! Unclutterer started blogging twice a week for Real Simple magazine’s website RealSimple.com. You can check out our advice here. Unclutterer was named a top life hack blog by alltop.com. More than 846 people have joined our Unclutterer flickr group. There are 377 photos uploaded to the group, and we look forward to seeing your additions! As the final installment in our Unclutterer month of sharing, I am honored to present Gina Trapani, founding editor of Lifehacker.com, a daily blog about software and personal productivity. We are truly honored to have Gina as our keynote guest post author. Just like physical clutter creates negative psychic weight, so does clutter in the digital spaces we work in every day—like our email inboxes. Email overload is one of the biggest sources of anxiety and overwhelming for anyone who works on a computer every day. When you’re faced with an inbox stuffed with hundreds of messages—and you’re not sure what you meant to do with each of them—it’s too easy to feel like you’re drowning in stuff and you’ll never catch up. Here are a few simple ways you can clean up your email box and get that wonderful feeling of being free and clear of email overload. Since we come from the physical, paper world, we tend to have a “filing cabinet” approach to our digital documents. But you don’t have to make as many digital folders as you do physical folders because you can search digital documents like email in ways you can’t search paper. So when you decide on the folders (or Gmail labels) you want to use to organize your email, don’t go overboard. Use as few filing places as possible to keep things simple. Remember, you don’t want to trade inbox clutter for folder clutter. Now that you’ve processed today’s messages and gotten to an empty inbox and a resolution to keep it that way, it’s time to tackle your backlog folder. First, ask yourself: if an email is older than a month, does the sender really still expect a response? Be honest. Most likely, the answer is no. If it was that important, the sender probably contacted you again more recently, or using another method. This may seem scary to some folks, but I recommend taking all the messages older than a month (or even two or three weeks, for the brave!) and simply moving them into your email archive. Now you’ve got email backlog from the past month to process. Each day, commit to reducing this pile by half. Start at the oldest messages and respond and file using your new folder system. If you’ve got 500 backlogged messages, after the first day you’ll only have 250. After the second, 125. The third, 62, and so on. 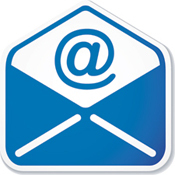 Within a couple of weeks, using this new system, you’ll be free and clear from email backlog. Gina Trapani’s new book, Upgrade Your Life, is a compilation of Lifehacker.com’s best tips for working smarter. 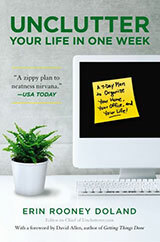 You can download a free sample chapter of Upgrade Your Life at the book’s official web site. 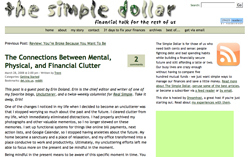 Unclutter on The Simple Dollar and a (sort of) new e-mail feed! Our month of sharing is continuing in full force, and today you can read more information from us on The Simple Dollar. The article, titled The Connections Between Mental, Physical, and Financial Clutter, explores mindful consumption and the benefits of not running on automatic pilot. Please check it out and leave a comment to let us know what you think! While I have your attention, I also wanted to let you know that you can now Subscribe to Unclutterer by e-mail. If you don’t read our blog through an RSS feed reader, you might think about an e-mail subscription. We’ve added a permanent link to our e-mail feed in the middle column in the group of links immediately under our welcome statement. It actually turns out we’ve had an e-mail feed since we started the site last year, but none of us knew about it. More than 500 of our daily readers, in fact, have been receiving it! It wasn’t until we went to create the feed that we discovered its existence. We’re baffled, but excited that we can publicly share it with everyone. This link might also be good to share with others who you know don’t use a feed reader but could enjoy our site through e-mail, so please feel welcome to share it! I like this office because it can fit into any living space of a home. The design elements might not be your style, but the concept can work for anyone. It has a few office items — stapler, pen cup, computer, paper shredder, filing basket — but otherwise it’s just a small table and a chair in a room. The wireless printer sits in another area behind a cabinet door, out of sight. 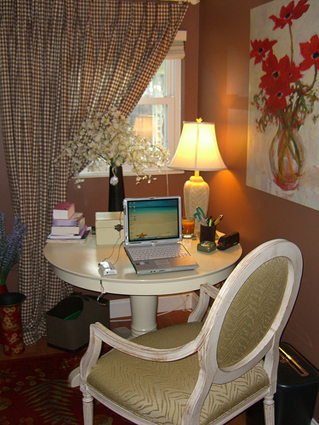 If you’re someone who doesn’t have a whole room to devote to an office, this is a great, uncluttered alternative. Thank you, TheHapp1 for your submission! A few weeks ago, I wrote about uncluttering your computer’s file system, and several of you left some great comments about how you have incorporated external storage into your setup. External storage isn’t just for techies with massive drives full of music, movies, and software. It’s essential for backing up files, or for simply getting older files that you need to keep out of the way. For those of you who haven’t used external storage before today, I’ll offer a brief overview to get you started. First, the cold hard truth. Computer hard drives fail. It’s not a matter of “if,” but “when.” Since they are guaranteed to fail, neglecting to back up your data is one of the quickest routes to an uncluttered computer — but the reality is that it makes about as much sense as uncluttering your home by burning it to the ground. If you’re maintaining an uncluttered file system, you’ve kept files for a reason. Just as we suggest honoring mementos, you should honor the digital files that you don’t delete by keeping them safe. External storage is also a great way to keep older files from cluttering your search results. I like to archive projects that are over a year old and keep them off of my primary hard drive. This reduces the number of results that come up when I search for files, and also keeps my internal hard drive from becoming full. I also keep all photography and other media files on external storage. These are the simplest of the external storage options. A Firewire/USB drive consists of a normal computer hard drive enclosed in a case that includes Firewire and/or USB connectors. You just plug it in to your computer, and drag-and-drop files to it just like any other folder. Drives like Western Digital’s My Book include one-touch backup to make safeguarding files simple, and smaller USB-powered drives like the Passport let you take lots of files with you without the clutter of extra power cables. There’s a trade-off for such simplicity, however. External drives, like internal drives, are subject to failure. You should still back up files that you store on an external drive, unless you use the external drive itself only for backup. Where Firewire/USB drives connect directly to your computer, a network attached storage (NAS) device connects to your home network via a router. Though integrating a NAS into your storage setup adds the complexity of home networking, the additional flexibility can be worth the effort. NAS devices vary from single drives, to multiple drives that offer the benefit of data redundancy; if one drive fails, you can replace it without losing any data. For my personal storage needs, I invested in a ReadyNAS NV+ loaded with four 750 GB Seagate drives configured in a RAID array. If that seems complicated, it’s much simpler than the half dozen USB drives I’d filled with files, photos and my CDs. If it weren’t for the NAS, I’d have power and USB cables everwhere — talk about clutter! If you’re comfortable handling hard drives, and don’t need so much storage right away, you can buy your NAS without drives, then get your drives from someplace like NewEgg and install them as you need them. Just keep in mind that you’ll need to install at least two drives to take advantage of drive redundancy. You’ve got to love the internet. The ubiquity of broadband internet, and declining data storage and bandwidth costs have finally made backing up files online a cost effective alternative to network attached storage. Pricing structures vary among online storage services, but generally a relatively small monthly fee gets you access to enterprise class data centers where your files are protected by the same hardware and geographic redundancy that businesses use to protect their valuable data. The services available are too numerous to list here, but some popular options for you to check out include Mozy, XDrive, Box.net, and Carbonite. One of my favorite online storage tools is Jungle Disk. Jungle Disk isn’t an online storage service itself, but a program that lets you store and retrieve files on Amazon’s Simple Storage Service just like an external drive on your computer. Jungle Disk is a free download, and you pay Amazon for only the storage space and bandwidth that you use. If you’ve got a favorite storage or backup solution, please share it with us in the comments! We hope that everyone has enjoyed Brian’s three-part series on data organization. Brian is one of Unclutterer’s amazing programmers, and we are so happy that he agreed to write this series during our March month of sharing. Thank you, Brian! A recent San Francisco Chronicle article highlights a program that the city of San Francisco’s Department of Aging and Adult Services and the nonprofit Mental Health Association of San Francisco have created. They have teamed up to create the Institute on Hoarding and Cluttering. The program will help local hoarders deal with all aspects of their obsessive behavior. Nationally, an estimated 1 million to 2 million people are compulsive hoarders. And while statistics aren’t available for just how many people in San Francisco suffer from the condition, experts say the city has become the center for study of the problem and might have more hoarders per capita than other areas. The compact, expensive city has many SRO hotels and other small living spaces as well as an aging population that has had years to collect clutter. Dementia also can contribute to hoarding. The nonprofit Mental Health Association of San Francisco and the city’s Department of Aging and Adult Services have teamed up to create the Institute on Hoarding and Cluttering. That group conducts training of professionals such as nurses and in-home care providers, and last summer officials launched an effort to enhance communication among city agencies that work with hoarders. The association sees about 250 new hoarding patients a year and runs a support group for them. The Department of Public Health has two inspectors, including Oblena, who visit SRO hotels that are run by nonprofits contracted by the city to provide housing. For those of you in the San Francisco area, there will be a 16-week hoarding and cluttering treatment group that will be held starting Monday, April 28, 2008. We realized last week that we haven’t ever explained the Unitasker feature on our site. So, before we delve into the goodness that is this week’s item, we wanted to take a few seconds and talk about it. At their most basic elements, all Unitasker posts are intended to be funny. We joke about single-use items to remind us that organizing doesn’t have to be so serious. It’s good to pause and remember that what we discuss on the site isn’t brain surgery or rocket science. Often times, the things we mention are things that are in our homes. I have an ice cream maker, a juicer, and a few other items that have been discussed. Matt has the snowball maker. We were both oddly tempted by the martini shaker! Forget squeezing your fingers into a jar trying to grasp a pickle to no avail. This nifty pickle picker does the work for you. Simple and easy to use, the picker is great for any jarred item that is difficult to grab. Just push down on the plunger, grab the item out of the jar and release. Did I mention it can also pick up banana peppers and be used to annoyingly poke your little brother? (Maybe it’s not a unitasker after all?!) Regardless, if something is in a jar and you don’t want to waste a perfectly clean fork or your fingers on such a task, then this is the tool that can get the job done. **Unitasker Wednesday posts humorously poke fun at the single-use items that manage to find their way into our homes. As paper becomes less and less important in the digital age, the paper boarding pass may also be a thing of the past. According to this New York Times article, at least six airlines are already allowing travelers to check in with their mobile devices. Although this check-in process results in a paper boarding pass issued at the ticket window, it saves you from having to print an additional copy beforehand at your home or office. Currently, Continental Airlines has begun testing a completely paperless boarding pass. The Continental electronic pass allows travelers to pass through security and board the plane without handling any paper at all. 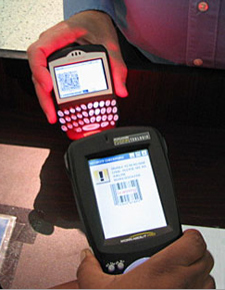 Continental sends a bar code to your mobile device and it is then scanned by security and gate agents. Although I love the idea of paperless boarding pass, I have little faith in the TSA agents actually being up to speed on technological advances. I hope to be proven wrong. I had no idea this morning when I posted the Semi-homemade cooking for busy people article that it would be such a controversial topic! Apparently, Sandra Lee is a hot button issue. Who knew?! One of the good things that has come from those comments is that a handful of people have made suggestions for alternative cookbooks than the one I suggested. 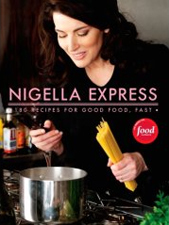 Instead of having you pore back through all of those comments, I decided to pull out the cookbooks that have been named. If you have other fast and easy cookbooks to add to the list, please feel welcome to put them in the comments to this post. Hopefully this post will be more beneficial to our busy readers! 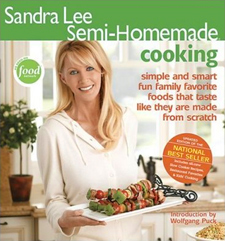 The first time I saw Sandra Lee’s cookbook Semi-Homemade Cooking in the bookstore, I let out a condescending scoff. How could a self-respecting woman call herself a cook and not actually make things from scratch?! I wish that I could say these horribly judgmental and rude thoughts happened decades ago when I was a young tyke, but if you followed the link above you saw that her book didn’t come out until 2005. Shame on me! The truth of the matter is that Lee’s cookbooks are perfect tools for modern, busy people. If it’s a choice between eating dinner at a fast-food restaurant or eating a semi-homemade meal at home, the semi-homemade meal is the preferred way to go. The nutritional difference between frozen vegetables she often suggests using and fresh vegetables is minimal (no difference, actually, in a lot of cases). The time it saves in preparation is definitely worth it for people in a pinch. And, the value from eating a meal around the table is priceless. Even when preservatives are involved — and they aren’t in a good chunk of her recipes — they’re still in lower amounts than in lots of fast food. A family that is trying to clear the clutter and make room for things that really matter in life can find instant help with Lee’s cookbooks. If you haven’t heard about them before today, they’re definitely worth a look. Are any of you owners of Lee’s cookbooks? What are you opinions of semi-homemade meals? We’d love to read your views in the comments. Matt and I have a couple conversations a day about the stress he is experiencing from selling his home, buying a new home, boxing up his old home, selling extra furniture as he downsizes, and unboxing everything into his new space. He lives more than five hours away from me, so I’ve just been giving pieces of advice that I think might help the process run more smoothly. Unfortunately, I’ve been about two steps behind on providing him advice throughout the whole ordeal. When I ask if he’s thought of something, it’s already checked off his list. He and his wife are organized, and they certainly knew what they were getting into with this move. One thing I had wanted to suggest to him was to hire a staging professional before his first open house. A staging professional is an organizer who focuses their career on organizing and preparing houses to go on the market. In Matt’s case, his house had already sold by the time I came up with this suggestion. However, if you’re considering selling your home, maybe this bit of advice will be beneficial to you. The premise behind having your home staged is that the way you go about the day-to-day activities in your home isn’t necessarily conducive to what a potential buyer wants to see. If your place is disorganized, then the buyer can only imagine being disorganized in the space. However, if your space is organized, then the potential home buyer can imagine being organized there. I love working with professional organizers, so bringing in someone who does this full-time makes a lot of sense to me. Often times, your real estate agent can suggest a staging professional in your community. If he or she doesn’t know one, or you’re selling your space without an agent, you can do a search through the Staged Homes website for a professional in your area. If no one comes up in your area, consider using a general professional organizer, which you can locate through the National Association of Professional Organizer’s referral site. On Wednesday, the amazing Unclutterer programmers launched our Real Simple Widget on our site. Have you seen it? It’s in the middle column immediately below the categories list. You have to scroll a bit, but it’s there! If you click on the words Real Simple in the widget, they will take you to the Simply Stated: Home community. If you click on a headline, it will take you to the specific post. Two Unclutterer posts are listed at a time, with the top one being our most recent work. I want to strongly encourage everyone to add the RSS feed to their feed readers. This way you can get our content automatically. To subscribe to the feed of only Unclutterer posts from the Real Simple site, go here. To subscribe to the whole Simply Stated: Home community, go here. Now that the Real Simple widget is in place and we have a specific Unclutterer RSS feed, I’m planning to stop writing post notifications in our main content. So, if you want to continue to read our Unclutterer posts on the Real Simple website, you’ll want to use the widget or subscribe to the feed. Please drop me a line in the comments if you have any questions about subscribing to the RSS feed or discover any bugs while using the widget. Also, if you want me to keep posting regular notifications for the Real Simple posts, I’d like to know that, too. Thank you to all of our readers for taking the time and effort to read us throughout the internet, we greatly appreciate it!